One of my all-time favorite flavor combos is apples and cinnamon. Add almond butter and a dash of sea salt to that, and magic happens: it tastes like apple pie... I promise. 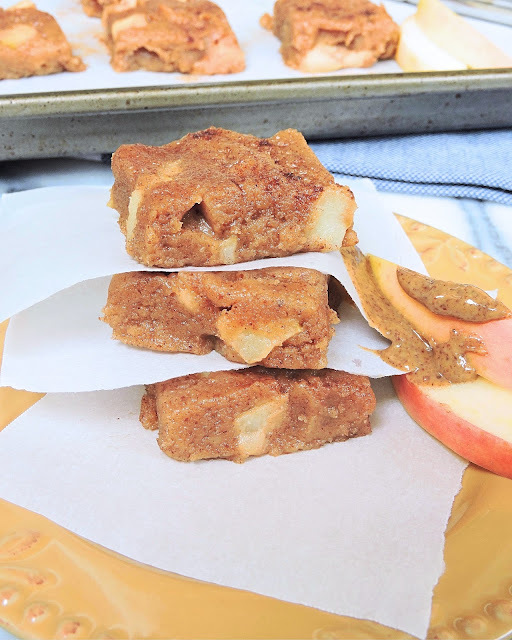 So you could easily mix up a snack bowl of apple sauce, almond butter, and chopped apples with the cinnamon-sea salt sprinkling over top and get that super yummy flavor... 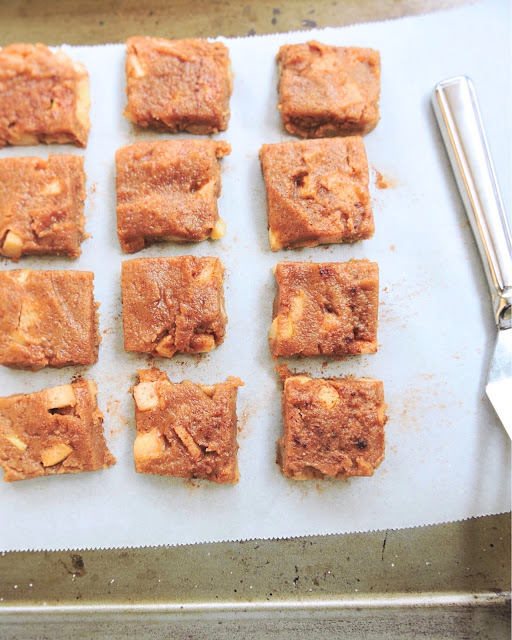 But there's something about these no-bake bars that feels so much more satisfying. Whether I'm on a Whole30 or not, one area I always find myself searching for more variety is my snack selection. 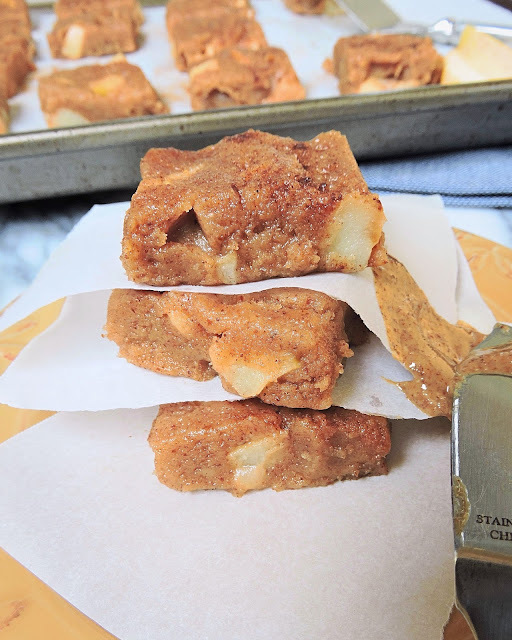 RXBARs and Chomps Snack Sticks are always my go-to's, but you know it always just feels better to eat something homemade instead of packaged... and it's definitely more cost effective! Not to mention the flavor of something fresh (always > packaged). I set out to create something I could snack on with plenty of healthy fats, some good carbs, and a bit of protein (you know, a complete snack). And my other big concern? Flavor, of course! 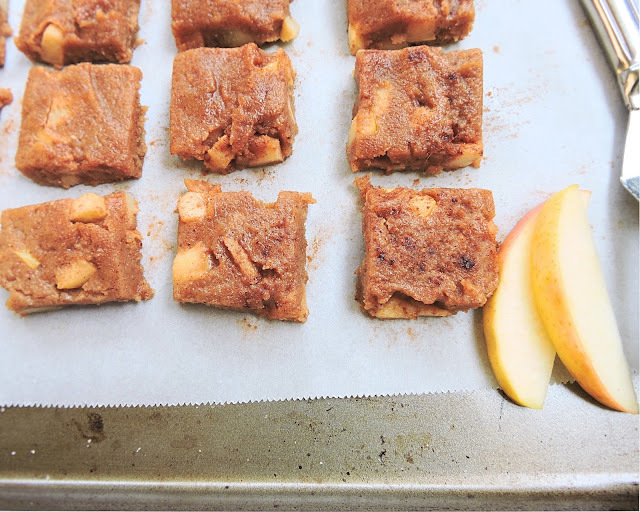 These no-bake bars turned out just right: they're the perfect creamy, dreamy snack with so much flavor from the apples, and almond flour mixed in for the perfect texture. Did I mention I quick sauté those apples in ghee with the cinnamon? The flavor & smell is seriously to die for! Enjoy these straight from the fridge for a cool, creamy bite of "apple pie" flavor, with NO sweeteners whatsoever. In a skillet over medium heat, melt 1 Tbsp of ghee or coconut oil. Add the diced apples and cinnamon, sautéing until the apples just begin to soften, about 2 to 3 minutes. Turn off the heat, and allow the apples to cool. In a medium bowl, combine the remaining ghee or coconut oil with the almond flour, almond butter, apple sauce, and collagen (if using). Stir in the apples and a pinch of sea salt. Transfer the mixture into a 8" or 9" baking dish lined with parchment paper, smoothing over the top. Refrigerate until firm (or speed it up by sticking them in the freezer for an hour or so). 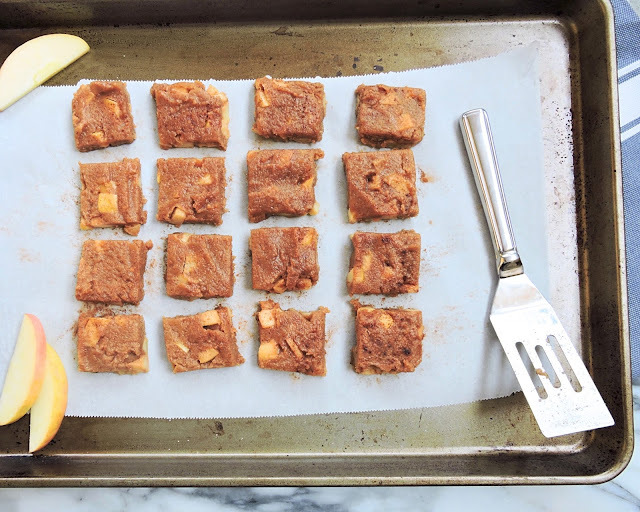 Slice into squares to serve. Best eaten cold, straight out of the fridge! Thank you very much for sharing this yummy dish information here. I will make this . I hope your recipe will help to prepare this dish. I just found your blog via whole30 recipes and am loving exploring! Are these not SWYPO dessert? I suppose its the same as eating an rx bar when I get peckish at like 4 but it feels like a dessert. Could these be frozen do you think so I'm not plowing through them before they go bad? I usually have pumpkin seeds as a snack bc I prefer salty but I do have rx bars sometimes and could have these instead.